1. Praxat will be more thoughtful and will think more before she says something. Suggestion, maybe Althena should go instead of Praxat this time. Well Praxat just gave Dash and Cyanna two Toadian dictionaries and she has her laptop out with a database program open so that the gang can updated with information. Praxat said she would go but she can always change her mind. Still awaiting the PM, Cyke! Praxat will be stay and Althena will be going instead. Parsley is what happens when reality meets – and exceeds – expectations. Born the eldest child of Saiyan Elites Guar and Lettise, Parsley was expected to be an extremely powerful saiyan from birth. Born with a power level of 150, she was never in any danger of enslavement. Rather than rest on her laurels and coast through the CTC, she used that guarantee to ensure that her growth was as steep as possible. By the time her training began after formal education, she had a power level of 230. By the end of her first year, it had doubled to 460. This caused her instructors to label her as a prodigy. The praise and adulation came from every direction. Were saiyans capable of things such as humilty and modesty, Parsley may have simply deflected it and kept her head in her training. She didn't. At the young age of 11, she developed an ego that would put even the most powerful saiyans to shame. When a band of saiyans returned with a new method of determining potential in young ones – stolen from the race they had just finished razing – it only grew. 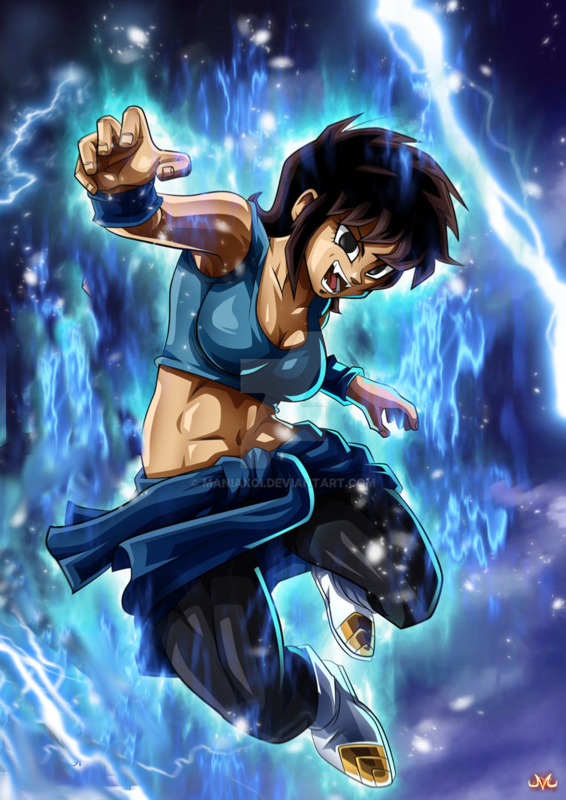 It was determined that she had the potential to be one of the most powerful saiyans alive, even rivaling King Mato. It went straight to her head. It all went to her head and made her believe that she was the most powerful already. Her talent flourished her second year, swelling her power to 755. After her third year, it exceeded 1000. The instructors at the CTC were amazed and dumbfounded. They had only seen this kind of rapid development in two other saiyans, King Mato and Queen Toma, the two most powerful on the planet. Many believed that Parsley would surpass them and take her rightful place on the throne. By this point, her younger sister, Sarada, was about to start her first year. The same Potential Prediction System was used to measure her potential. The results were astounding. While Parsley was slated to rival King Mato, Sarada was predicted to surpass him. Meaning that she would surpass Parsley as well, by a pretty good margin. This would not do. She would not stand for her younger sister – or anyone, but especially not her – being stronger than she was. She did what she needed to do in order to ensure her place at the top of Vocadan society. At the end of her fourth year, she was measured at 1345, then 1855 at the end of her fifth. When graduation came at the end of her final year, she was measured with a staggering 2250. At the age of 16, she was already a Super Elite. Her power only grew when she started to partake in conquests and mercenary assignments. As her power grew, so did her fame, until she was known across the planet as the prodigy who would one day challenge for the throne. This did not escape the attention of the king himself, who invited her to the palace to spar. When they finished, he was impressed by both her strength and her attitude. Despite her ego, she appears to be a pleasant person to be around, much more so than other Saiyans. Has seemingly grown out of her manipulative, deceitful ways. Is in love with Avoca. Last edited by LilSusie; 02-11-2019 at 01:56 PM. Huh, strange there isn't a PM option for you....might be linked to the number of posts to keep people from making accounts and spam PMing. In any event I'm sure Sub will see this soon enough. Your Super Saiyan form is nothing compared to the might of watermarks and trademark law! That was just base Saiyan form. Also the PL of that form is.....not quite accurate. Regardless, I shall be doing PL’s again soon and that and Cythlla shall be updated alongside everyone else. inb4 the people who stayed behind get nothing. The circumstances of Cthyllas PL are a bit weirder then normal, yeah. Theoretically she isn't getting stronger as much as growing accustomed to operating and managing her fake body. Does Althena have a Power Level? Hey Tami, has anything happened with regards to Meagan trying to rally the other Kami together as she and Asha'rah discussed?